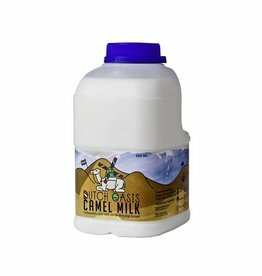 Please note: the camel milk in 300 ml bottles is only sent on Wednesday. Orders placed and paid for Tuesday 10 p.m. are shipped the following day. On Monday, of course, the raw camel milk is sent in 0.5 liters. If you want to order the 0,5 liter bottles, click here. The camel milk comes from the one-humped camels (dromedary camels). The quality of the milk is carefully monitored according to the Hygiene Package for dairy farms. After the camels have been milked, the milk is shortly processed and put in bottles of 0.3 liters. You can keep the fresh camel milk in the refrigerator the until the stated expiry date (up to max. 14 days after shipment). 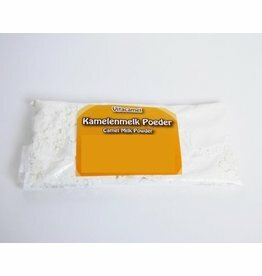 This camel milk is processed in such a way that it lasts longer, but all the positive properties of the camel milk are preserved. Some people do not drink cow’s milk. Camel milk could be a good alternative for these people. The taste of Camel milk is similar to that of cow’s milk. Camel milk is 100% cow’s milk protein-free. And contains only camel milk proteins. These proteins contribute to the growth of muscle mass and maintaining muscle mass and bone. Camel milk is a source of calcium this contributes to a normal blood clotting. Camel milk doesn’t contain beta-lactoglobulin. The camel milk comes from the one-humped camels (dromedary camels). The quality of the milk is carefully monitored according to the Hygiene Package for dairy farms.